The first General Meeting of 2010 took place on Saturday, February 6, 2010, from 1:00 p.m. to 4:00 p.m. at the NCTA’s New Venue: the San Francisco State University Downtown Campus located in the Westfield San Francisco Centre, 835 Market Street at 4th Street, room 667, 6th floor. Yoga teacher Claire Lavery demonstrating relaxing techniques. The meeting enjoyed an excellent turnout, with over 50 members and non-members in attendance. There were even some special guests: Cristina Navia and Leo van Zanten drove all the way up from Ventura County just to attend our meeting! They do not have a local chapter there. All present welcomed them to the meeting and were very happy that they could attend. Members and guests enjoyed networking and beginner orientations, and then the main meeting started promptly at 1:30 p.m. with announcements regarding the NCTA Board Election results. A new, electronic, voting system, used for the general election to the NCTA Board for the first time was received with overwhelming popularity: most members voted on-line, thus saving trees and NCTA funds. Then it was time for the social calendar and NCTA workshop announcements—there was a full calendar for spring, with some very interesting events, including a workshop covering tools, tips and techniques of working with PDF files, a joint NCTA-CAT literature translation workshop, and a workshop titled, “Lessons from Business School: The Entrepreneurial Linguist.” Events Director Raffaella Buschiazzo reminded us of the upcoming Happy Hour gatherings in San Francisco and Oakland and encouraged members to organize and post more social events. NCTA President Tuomas Kostiainen presented the annual NCTA report—NCTA now boasts close to 500 individual and over 40 corporate members, and the number of Translorial subscribers went up to 319, an over 20% increase from last year. The popular NCTA Yahoo! group has over 70 members and, in keeping up with new technologies, NCTA now has a Facebook page and a group on LinkedIn. Tuomas’ presentation also covered some financial highlights of the 2009-2010 budget—the organization still enjoys a healthy balance sheet, the income from the workshops is increasing and is also saving money with more corporate sponsorships for general meetings. 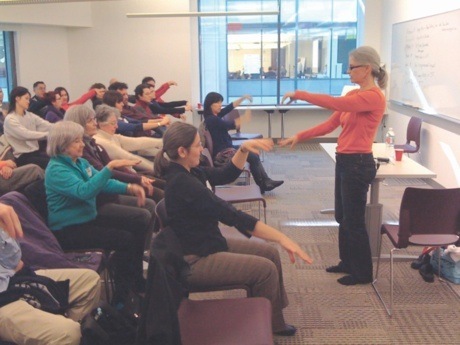 Then it was time for the meeting’s main event—a special presentation, “Ergonomics in the Workspace: A Yoga Approach” by Claire Lavery, an experienced Berkeley yoga teacher. Ms. Lavery has been practicing yoga for over 20 years and teaching it for 9 years. Her own experience with yoga has informed her studies on alignment, breathing, and the many health and psychological benefits a yoga practice can bring. During this hour-long presentation Ms. Lavery discussed and demonstrated ways in which to move, stretch, sit, and work comfortably with “your existing technology and your current physical body.” The lecture started with ergonomic tips on proper sitting, posture, chair height, and the ways in which organizing one’s workspace will make those long hours spent in front of the computer easier on the body. Claire showed us how simple household items may be used as handy ergonomic aids—i.e. a rolled-up towel works amazingly well for lumbar support or, folded up on the floor, may work as a foot rest. A tennis ball deserves an honorable mention as it can be used as a wonderful tool for massaging feet and palms and helps to relax tight muscle groups. Claire then proceeded to take us through a sequence of yoga stretches and openers for the whole body, from the feet all the way up, demonstrating such delicious stretches that many in the audience were tempted to try right there. If you want to try some of Claire’s sequences they are available here. Claire also reminded us to take breaks from the computer at least once an hour, walk around, move, breathe deeply and relax, and discussed the importance of room temperature and proper use of light. A nice eye exercise sequence was also presented as well as facial massage techniques to ease overall tension. Everyone greatly enjoyed the breathing, stretching, and Oming with Claire! After a brief and very informative yoga question and answer session, a quick survey on the new meeting location was taken and members indicated that they really like it. More networking followed, and continued into post-meeting dinners. All in all, a very productive and informative session enjoyed by all. Nina posted this article under Business Services, NCTA Meetings	on Saturday, May 1st, 2010 at 12:06 pm	You can follow any responses to this entry through the RSS 2.0 feed. Both comments and pings are currently closed.